Police officer who was fatally wounded in the attack on a synagogue in Jerusalem dies of his wounds. 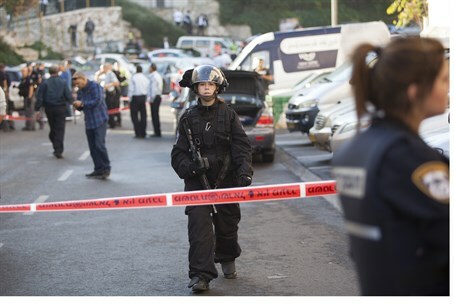 The death toll in Tuesday’s terrorist attack at a synagogue in the Har Nof neighborhood of Jerusalem has risen to five, after an officer who was fatally wounded in the attack died of his wounds Tuesday night. The latest victim has been identified as Zidan Seyf, 27, a Druze police officer from the Arab town of Yanuh-Jat, located in northern Israel, northeast of the city of Akko. Seyf was among the officers who arrived at the scene of the attack and, after a shootout, were able to take down the terrorists. He was taken to the Hadassah Ein Kerem Hospital where, after hours of fighting for his life, the doctors pronounced him dead. He leaves behind a wife, a four-month-old baby, parents and five brothers. He will be brought to rest on Wednesday in Yanuh-Jat. Four other victims in the attack were Rabbi Moshe Twersky, 'Rosh Kollel' for the 'Torat Moshe' yeshiva and grandson of Rabbi Joseph Ber Soloveitchik; Rabbi Kalman Levine; Aryeh Kupinsky, and Avraham Shmuel Goldberg. Police revealed that all four victims were dual citizens, with three holding American citizenship, and the fourth British citizenship. The four were brought to rest earlier on Tuesday.